People are of two minds about sharpening, I believe. Some hate sharpening. They despise having to stop working, even though they realize that sharp tools are safer and easier to use. Like other necessary things we wish we didn’t have to do, we recognize the value, even as we’re wishing. Others might not mind sharpening, but I don’t think anyone loves it. I’ll go one step further: I believe the former group struggles with getting a good edge and the latter is good at sharpening. Sadly, I’m in the first group. We conversed about machines that might help, and they encouraged me to just concentrate on hand sharpening with stones. And, to practice, practice and practice some more. Not long after that I was watching a Matt Cremona video, and noticed he had one of those little blocks some folks use that sets the distance from the front edge of one’s chisel to the sharpening jig. Having that jig allows perfect repeatability for the sharpening angle. I made a block like that for 25i and I was off to the proverbial races. It seemed I could do no wrong in sharpening my chisels. Then, one day, something happened. I sharpened a chisel I’d put an edge on with that same technique, and it wouldn’t cut worth a hoot. I figured I’d just gotten in too big a hurry, overconfident, and messed up the edge. So, I went back and honed it up from 1000 to 8000 and tried again. Some people just have it. I took a class at Arrowmont College once, and the instructor was working with one of my chisels and said, “I just can’t use this. Do you mind if I sharpen it?” What was I going to say, “No, I like it like that way?” She took it to a high-speed grinder and shaped it the way she wanted it. No, she did not blue the edge. She spent a few minutes on a wet stone and the chisel cut like she’d been honing for hours. I asked her to sharpen two other chisels, which she pleasantly did, spending about the same amount of time on each one. I’m not exaggerating when I say I didn’t need to sharpen one of those chisels again for a year! After Steve Johnson did a video review on the Tormek T-4, I thought it might be just the breakthrough that I needed, a machine to get a good shape on my chisels and plane irons that would allow me to just fine-tune on stones. It might still be my sharpening salvation, but I’ve been so busy since it arrived that I’ve only had time to unbox and assemble it, and there hasn’t been time to do anything else with it. It didn’t take long to figure out the Tormek Sharpening System can’t be up as high as sharpening stones. I found this desk up the street when some folks moved out in the middle of the night and left a lot of their stuff for the garbage man. With a top and some wheels, I hope its height will be ideal. Maybe I can become one of those people who is good at sharpening and doesn’t dread it. I’ll let you know when I do my review of the new Tormek. I will say I do not mind sharpening at all. I sharpen for the task at hand. I do not usually go to the high value grits as a 1K grit and a strop usually will suffice. I will say I am more likely to use 3 different strops (successively finer paste grits) than I am to use all 3 diamond stones. The Paul Sellers youtube video on sharpening was probably the key to my overcoming my aversion to sharpening. Best of luck. Tell the minions at polldaddy to allocate more space to the “Other” response. If you don’t want to pay for the scoring of open-end responses, don’t put them in as an option! In response to your question, I demand sharp tools, even my pocket knife! 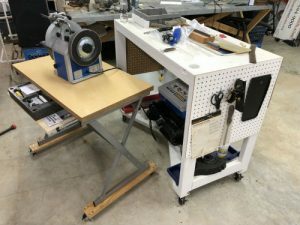 If a tool requires me to touch-up an edge during a woodworking session, I have a dedicated sharpening station in my shop for exactly that purpose. I use diamond stones/paste, strops & jigs which greatly expedite the process. In fact, many tools simply require the strop for the required touch-up. Further, before I sweep-up, I sharpen every tool used during the session so that when I start the next time, everything is ready. I believe that many (if not most) people who avoid sharpening their tools have never experienced using a very sharp, well tuned tool. A week long class with Garrett Hack introduced me to just how wonderful it is use a nice shar,tuned plane and then the joy of he surface it generates. Now I ca’t imagine using a plane that’s out of adjustment or with a dull blade. The reward so outweighs the small effort of sharpening. Some day I will but a Tormek and everything will be razor sharp, but for now it’s the water stone and the strop and I admit I like to carve more than sharpening. I always touch up my edges whenever I go to use them on my projects I even stop when I use them when they aren’t preforming like I think they should. The sharper they are the better they work. I sharpen when tools need it. I have got a Tormek which I use to give a hollow ground edge initially, but find I get a better edge finishing with a fine carborundum stone followed by an aluminium oxide hone. As others pointed out, sharp is critical, whether cutting a potato, turning a spindle, routing the edge of something, scrapping a surface, mowing the lawn or any other project done using an edge. To that end, and thanks to craigslist bargains, I have a: 1) Variable speed (0-2500 RPM), reversible four wheel grinder; 2) An AirHandler, cabinet buffing station with built in dust collection; and, 3) A 1″x42″ Delta sander. The grinding station got two CBN wheels for high speed steel, and a Wolverine jig system. Between the grinding station and the sander, touching up edges is a relative snap. A stack of MDF blocks and wheels make honing a breeze too.